Devoto Gardens is a 20 acre diversified family farm nestled among apple orchards, pinot noir vines, and a bounty of flowers for cutting. Situated west of downtown Sebastopol, the farm is often canopied with cool morning fog that lingers into the afternoon hours, providing a perfect climate for cultivating flowers, grapes, and apples. In 1975, Susan and Stan Devoto bought the ranch that would become Devoto Gardens and began farming micro-greens and flowers the following year. But it didn’t take long before the family became obsessed with apples, and now they grow over 50 varieties of heirloom species. The Devotos grow as many heirloom apples as there are uses and tastebuds. Thousands of nuances make each individual apple delicious, whether its being used for raw eating, juicing, baking, or cider. Jolie (the middle daughter of three) acknowledges that the best tasting apples are also the most difficult to grow, and therefore, require the most dedication. Although apple trees are resilient, the more TLC they receive, the better the flavor of the fruit. Having grown apples for 40 years, the Devotos intimately know each variety: the time of harvest, what it tastes like at its best, and the amount of acid versus sugar in the fruit. The apple harvest begins with the Gravenstein in August and will last into November. 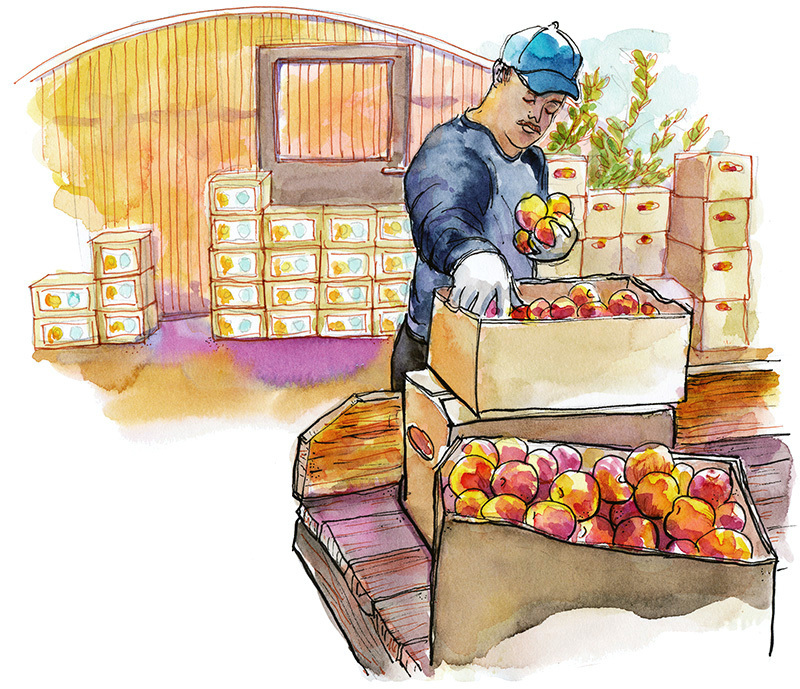 Once the apples have been picked, they are hauled from the orchard to a spot in front of the greenhouse where they are sorted, boxed, labeled, and loaded into a van for the markets. Gravensteins have a sweet/tart flavor combo with a little spice and bright acidity. They’re perfect for eating, saucing, baking, or in the case of Jolie’s new venture with her husband Hunter, artisan sparkling hard cider. 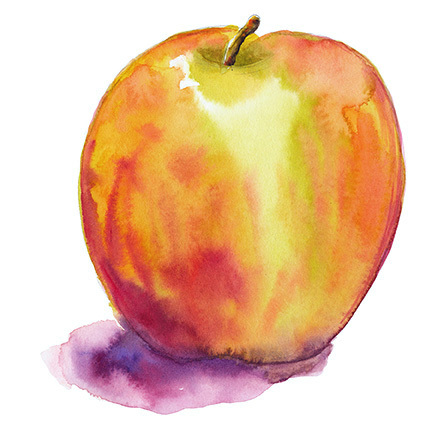 Regardless of use, the Gravenstein Apple remains a symbol of Sonoma County’s historical agricultural tradition. I’m saddened to hear today that Susan Devoto died last Friday. My condolences to the Devoto family. You can read the story here. August 17, 2013 September 16, 2016 Richard SheppardComments are off for this post. Sketches from Ready, Set, Sketch: Dry Creek Valley! 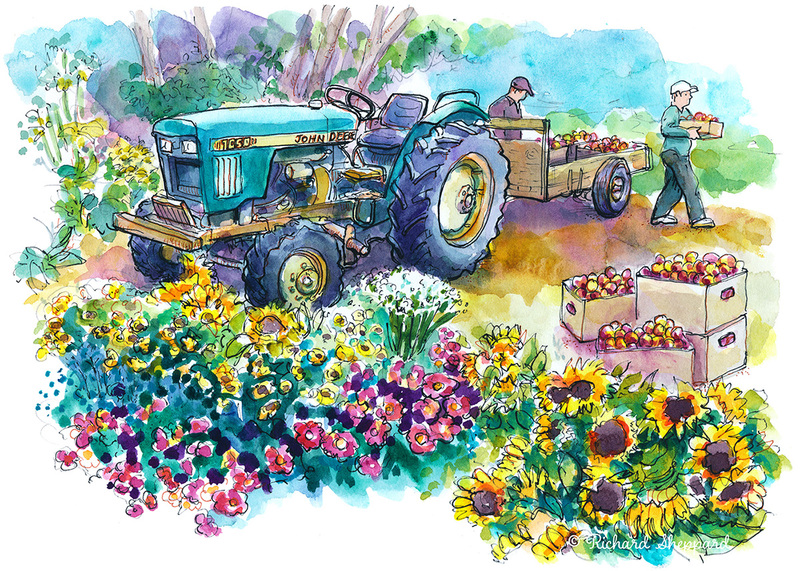 These sketches make me want to be at the Devoto Family Farm. Now I’m looking forward to eating some fresh apples! Thanks Cathy, the gravenstein’s are great apples, that’s for sure. While at the Devoto farm, I also got to try the “Pink Perl” which is my new favorite! It has pink flesh and tastes like a cross between a green apple and cherries. It’s delicious! Your colors make me “sing”…something about them just make me happy!! Thank you BJR, glad these colors make you happy! I’ve been using the same color palette for a few years now and I like how they mix together, happily! Though I’ve never met her, I enjoyed reading the tribute to Susan DeVoto. She sounds like someone who will be greatly missed. I liked the comment that she wasn’t a “windshield” farmer. As always, your sketches make me want to visit this place! And when I do I’ll definitely try a Pink Perl! Thanks Jean, I didn’t get a chance to meet Susan while I was sketching the farm but yes, she sounds like she was a wonderful person. I’m sure she’ll be greatly missed. And yes, Pink Perl apples are hard to find but if you find one, buy it, they’re delicious!